This expert, unbiased buying guide will help you find the best garage door for your home. Includes information on costs, steel garage doors, wood garage doors, and more. 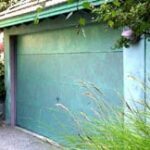 Is your garage door sagging, almost impossible to lift, or just generally falling apart? If it is, maybe now is the time to replace it with a new one that’s easy to operate and maintain. Not only can a new garage door provide safe, secure, and easy access to your garage, but it also can renew and refresh your property’s overall appearance, particularly if it can be seen from curbside. 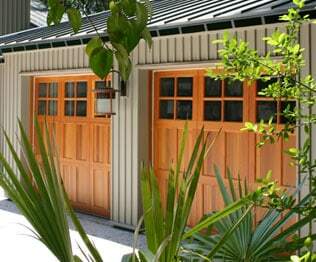 Garage doors are made from steel, wood and wood composites, fiberglass, vinyl, and aluminum. Though each of these has its benefits, steel and wood doors are by far the most common. All of the garage door materials are discussed in depth below. But here is a quick overview. • Wood is a classic because of its natural beauty, availability, and easy customization. But it just doesn’t last as long as other materials and thus requires fairly consistent care. • Steel garage doors have become very popular because they’re strong, relatively inexpensive, and low maintenance. 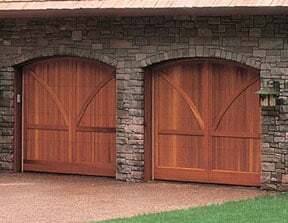 In addition, state-of-the-art steel garage doors do an excellent job of imitating the look of wood. What’s New with Garage Doors? In addition to the use of an increasingly broader selection of durable materials for their manufacture, garage doors have become high-tech, with high-performance insulation and energy-saving glazing, finished interior surfaces, baked-on exterior finishes and more. Some non-wood doors have been given very realistic wood grain surfaces that will accept a stain—it is hard to tell the difference between these and real wood. 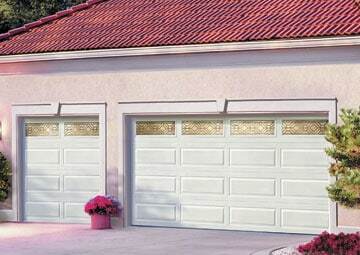 In terms of style, carriage-house garage doors have become very popular because of their classic look. For a sleek, translucent contemporary look, aluminum framed doors with opaque glass panels are hard to beat. What is a typical price for a new garage door? The answer depends on many factors. Because there is an incredibly broad range of styles and qualities of garage doors, prices are all over the place…from about $400 for a low-end wood composite door that you must install yourself to $9000 or more for a fully loaded high-end door with installation. On the average, expect to pay $800 to $1500 for a mid-range 16-by-7-foot door, installed. Upscale garage doors average about $2700. If you’ll want an automatic door opener, add $200 to $300, if you have it installed at the same time as the door. These figures don’t include tax or the cost of oversight by a general contractor if the job is being done as part of a bigger building project. The only way to really pin down a price is to figure out what you want and get bids—it’s wise to get at least three. The good news is that you get a solid return on your investment when you install a new garage door. According to Remodeling Magazine’s 2013 Cost vs. Value Report, a $1500 garage door returns 75.7% of its cost when you sell your home. You can buy garage doors at Home Depot, Lowe’s, or other major home improvement centers. The best way to shop these doors is to visit the company’s website, use any online design tools they offer, then schedule an in-store appointment (with some, an appointment isn’t necessary) so you can see samples first-hand. You’ll need basic measurements of your garage’s door opening (or your existing garage door). Before actually ordering a door, the installer may need to confirm your measurements. With most home improvement centers, you’ll pay in advance; financing is available. Another option is to purchase a garage door plus installation through from independent a local garage door company. Most of these garage door companies are distributors of doors made by major manufacturers—they buy and configure pre-made door sections and handle installation. Some also manufacture custom doors themselves. Some local dealers sell only one manufacturer’s garage doors; others sell a variety of makes. It pays to do your homework before talking with dealers by going online or contacting major manufacturers and requesting product information so that you can compare features. 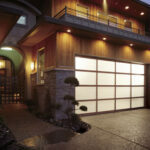 Some of the biggest garage door manufacturers are Clopay, Wayne-Dalton, Raynor, and C.H.I. Overhead Doors. You can find local dealerships through their Web sites. Though some garage door companies have showrooms, most will send a salesperson to your home to discuss your needs, show you brochures from the lines they carry, and measure your old door. The best way to find reputable dealers is to get recommendations from neighbors or friends. Otherwise, find out how long the companies have been in business. Most stand behind their workmanship and materials. Get written estimates from two or three. Some home improvement centers sell garage doors that are designed for do-it-yourselfers to install. If you buy a door to install yourself, be sure that it comes with complete and easy-to-follow instructions. See How to Install a Garage Door. Should you install a garage door yourself? Unless you’re an accomplished do-it-yourselfer, probably not. You need a helper, the work requires quite a few carpentry tools and skills, and the heavy-duty springs can be dangerous to work with. 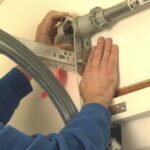 The job will probably take you a little more than a day, whereas a professional installer will can usually do it in about 5 hours. Installation normally adds from $250 to $500 to the cost. A host of options are available through most garage door manufacturers. You can order window sections for a decorative accent and to add daylight to a dark garage. Windows may be standard single glazed or, for insulated doors, dual glazed. Some doors have snap-in decorative frames. Garage door springs. Tilt-up doors sometimes utilize extension springs, the type that stretch and recoil at the sides of a garage door. Torsion springs—a shaft spring and drum assembly across the top of the door—are much better for sectional doors. Torsion springs distribute the door’s weight evenly and cannot break and fly off the way an extension spring at the side of a door can (they can break, but they stay put). Extension springs are cheaper, but most dealers prefer to install the safer and more reliable torsion springs. Note: Extension springs should be protected by an extension-spring containment kit—if a spring snaps, this will help protect you from serious danger. • Photoelectric safety devices that will stop the closing door and reverse it to the open position if an invisible light beam is broken by your car or—worse—by a child. • Miniature transmitters that fit on a key chain. • Transmitters that operate only with a personal code you program into them. • Multiple-button remote controls that will operate appliances and lights in addition to the opener. It’s important to think about how the door must perform and how long you want to ensure that performance. The type of weather and exposure it will have to survive and whether or not it needs to help insulate the garage. Will you be using the garage as an extra room or a workshop? Is there a room above the garage? If there is, you should get an insulated door. The following information will give you buying advice for the major types of garage doors. Steel garage doors are much stronger and more secure than wood, aluminum, or fiberglass ones. Thanks primarily to new technologies that allow for embossing metals with wood-grain patterns, plus new durable coatings, today’s steel doors rival the look of wood without the maintenance headaches. Steel doors won’t warp, crack, delaminate, or fall apart due to the effects of weather. And, because most are made of hot-dipped, galvanized steel that is vinyl clad or given a baked-on polyester finish, they don’t rust or require repainting as often as do wood doors. Most warranties guarantee the door won’t rust for as long as you own the house, but they do not guarantee against fading. On the downside, steel does dent and can be difficult to repair. Premium-quality steel doors have cores of rigid polystyrene or polyurethane foam insulation. Not only does this insulation help keep the garage warm in winter and cool in summer, but it makes the door lighter, quieter, and easier to operate. Plus, it is less likely to sag over time. You can usually discern a steel door’s quality both by its thickness and the thickness of its cladding. A premium door is often a full 2 inches thick, filled with insulation, and clad in 24-gauge steel. Less-expensive doors are thinner and made of 28-gauge steel (the lower the number, the thicker the metal). Doors may be single skin, with a frame that shows from inside, or double skin, sandwiching the foam insulation between panels on both outside and inside. If looks inside the garage matter, the double-skin construction is not only much more durable but also attractive. Weatherstripping is another measure of quality. The best-made doors have a full-width vinyl bubble weatherstripping along the bottom edge that conforms to the floor. They also have rigid vinyl end caps along the sides of the door panels, a vinyl top cap, and weather seals between each section. Styles imitate those of wood doors—flush, recessed panel, and raised panel. You can also get metal doors with a horizontal, ribbed design. For an average-size steel door, expect to pay between $750 and $1,200 installed. 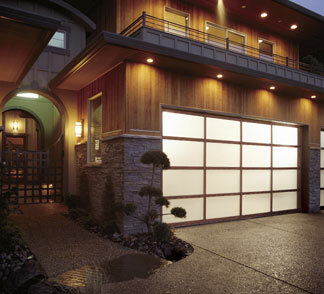 Fiberglass garage doors actually consist of an aluminum frame with fiberglass sections. Like aluminum, fiberglass is very lightweight. Other advantages of fiberglass are its translucency and its resistance to the effects of salt air, which is why fiberglass doors are sometimes chosen for locations where light transmission is important and for corrosive ocean climates. However, for more mainstream uses, fiberglass isn’t a very popular material because it is a poor insulator, it yellows with age, and it breaks relatively easily, especially when cold. Aluminum garage doors have enjoyed many of the same advances as steel garage doors—wood-grain embossing and durable finishes are typical. Aluminum single-piece tilt-up doors are fairly popular because they are extremely lightweight, will not rust, and are relatively inexpensive—from $400 to $700. Unfortunately, aluminum has a major drawback—it’s very easily dented. Wood is preferred more for its natural look, affordability, and easy tooling than for its durability. Because wood expands and contracts and can warp and crack as it weathers, it demands regular maintenance—repainting or refinishing every couple of years. The easiest to build and most affordable type of door is a tilt-up wood door. In many cases, it can be built right in the driveway by applying a skin of exterior plywood—usually 3/8 inch thick—to a frame of Douglas fir, spruce, or a similar softwood. Or, the frame and plywood can be covered with siding to match the house. This type of flush construction is quite strong, stable, and affordable. For a 16-by-7-foot flush wood door, you can expect to pay from $400 to $700. Sections of roll-up wood doors may have either flush or panel construction. Flush sections are made by fastening a plywood panel over a wooden frame, like a small version of the flush door described above. For panel doors, manufacturers fit several separate, rectangular panels into a wooden frame. The skeletal framework is built of fir or some other common softwood; panels are made from a variety of materials. Panels for a door that is meant to be painted may be flat surfaces of plywood or hardboard, or they may be three-dimensional raised or recessed panels. Cladwood, made from composites with resin-impregnated overlays, or wood lookalikes such as Masonite’s SureWood raised panels, are commonly used for the three-dimensional type. Cladwood composite panels come with a 20-year warranty, but most wood doors are warrantied for only one year. Installed, an average-size (16-by-7- foot) paint-grade sectional door normally costs from about $800 to $1,000. Appearance-grade wood doors—those that are meant to be stained rather than painted—have solid-wood panel inserts. These doors may be all cedar, redwood, or may have softwood frames with oak, mahogany, or other hardwood panels. When buying one of these, be sure to find out whether the panels are made from a single, solid piece or from several widths edge-glued together (since the joint between glued-up lengths may show). Appearance-grade wood doors are the most expensive available. One with redwood panels will run about $1,500; an all-cedar or oak-paneled door may cost $2,000 or more.